Built: 1993 Volkswert Stralsund Veb., Germany. Gt: 11205 t. Mdwt: 930 t.
Loa. 121,80 m. Br. 19,20 m.
Main engines: 2 x 6114 Bhp. MaK 6M552C. Thanks for the information Henk :-). 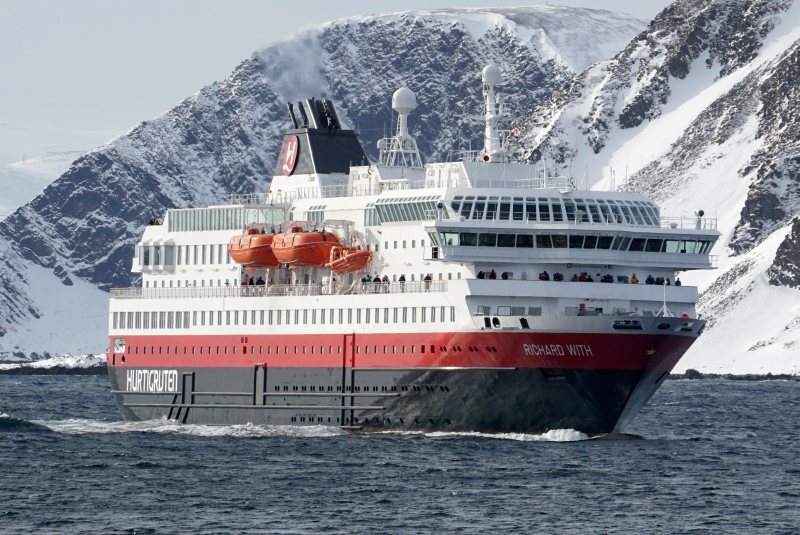 I think we will only stay in Hammerfest 02 and 03 of April during crew change and before that we will be in Rypefjord for some oil recovery testing. Not so good for us you will move to Hammerfest! To early (dark) for good shots! During your crew change maybe. That will be around 11:00 then! Her total deck 6 is renewed Geir. All windows at her aft deck are bottom view now with the cabins called mini suite and the last cabins have a bay window now called suite. Also the restaurant now has bottom windows. Indeed the price is extensively going up! NORDLYS is the next one to miss-happened in April coming. Again a mighty good shot Geir! It starts itching now!